The MISSION: IMPOSSIBLE franchise is a rare bird: It’s actually getting better as it gets older. Though the initial installments were commercial successes, they were on shaky ground in terms of critical appeal. But the studio nurtured it with time and money, and now we have fantastic tentpole movies that deliver on more than their initial promise. 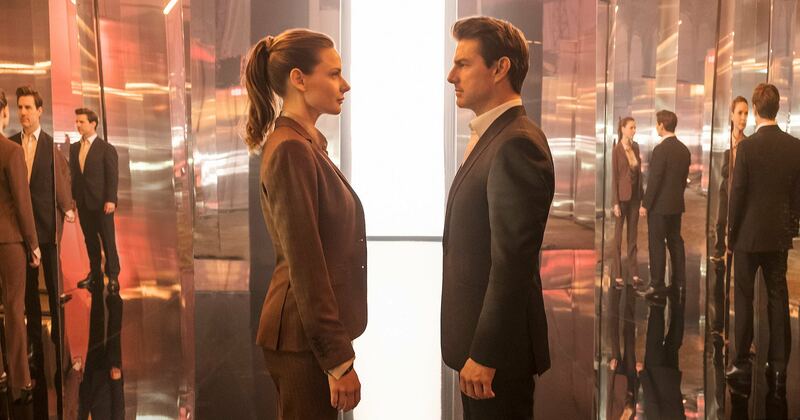 Writer-Director Christopher McQuarrie’s MISSION: IMPOSSIBLE – FALLOUT has everything you’d want in a summer movie (or any movie, for that matter): Big cinematic spectacle, meaningful character stakes, edge-of-your-seat action sequences and a badass ensemble on both sides of the camera. It’s awe-inducing, flawless workmanship, a technical triumph, and quite possibly a masterpiece – and not just in terms of the spy-thriller genre. McQuarrie crafts a solid narrative that deals with something we don’t often see sneaking up on our beloved heroes: consequences. 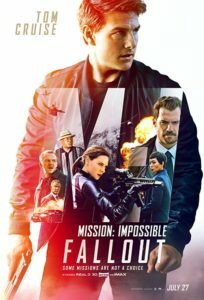 It’s been two years since the events of ROGUE NATION, and IMF agent extraordinaire Ethan Hunt (Tom Cruise) and his skilled squad – Luther Stickell (Ving Rhames) and Benji Dunn (Simon Pegg) – haven’t been resting on their laurels. The disciples of the crime syndicate leader Ethan captured, Solomon Lane (Sean Harris), have formed an extremist cell plotting to destroy the current world order. But when Ethan botches the mission to prevent plutonium from falling into the wrong hands, he and his team are forced into an even higher-stakes undercover game of cat-and-mouse. His task is made more complicated by CIA assassin August Walker (Henry Cavill), who’s been assigned by CIA Director Erica Sloan (Angela Bassett) to essentially babysit Ethan. Also, ex-flame/ ex-MI-6 operative Ilsa Faust (Rebecca Ferguson) shows up – and she’s got a different directive. 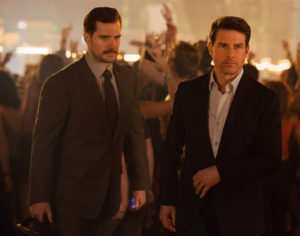 Henry Cavill and Tom Cruise in MISSION: IMPOSSIBLE – FALLOUT. Courtesy of Paramount Pictures and Skydance. The auteur makes sure to weave the theme tightly into the film’s fabric. Whether it be narratively, audibly or visually, the aftereffects of Ethan’s split-second, occasionally careless decisions are evident in every element of the picture. The protagonist’s inner turmoil is fueled by guilt and grief over previous failures, and McQuarrie fully explores this conflict through the house of cards being built. He’s forced to question the ramification of his actions time and time again. We see nuanced glints of this weighing on an emotionally-compromised, doubting hero within the facets of Cruise’s performance – which is his best in the series. The characters’ emotional drive remains at the forefront of all the pulsating, riveting action sequences. The indelible HALO jump and the midair helicopter rope climb are astounding sights, but an even more breathtaking sequence is the knock-down, drag-out fight in the Palais’ men’s room, where Hunt and Walker tussle with a suspected baddie. Here, Jeffrey Kurland’s costume design, Rob Hardy’s cinematography, Peter Wenham’s production design, Eddie Hamilton’s editing, and the work of the fight choreographers and sound designers all sing in glorious harmony. Hunt and Walker’s charcoal grey and black suits clash beautifully against the stark, bright white luminosity of the walls and floors. The suspect’s grey suit hints at his ambiguous nature. McQuarrie and Hardy employ angles and Steadicam movement that show off the tight quarters in and out of a stall. Setting the scene without the use of a traditional score – letting the sound design of punches, grunts, broken mirrors and hits taken through walls eclipse the audience –heightens the atmospheric tension. It’s a thing of beauty. That said, the pièce de résistance is McQuarrie’s outstanding finale. It’s imperative that other creatives take notes on how he keeps several plates spinning for a sustained period of time. The ticking clock scenario will leave you buzzing with excitement. He sections it off into four big parts and splinters them into smaller, even more pressing pieces, whilst making it all feel urgent and immediate. This is also where the women of this world are given standout moments to shine, demonstrating their mental and physical acumen. 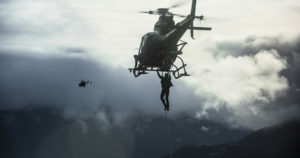 Tom Cruise in MISSION: IMPOSSIBLE – FALLOUT. Courtesy of Paramount Pictures and Skydance. Aesthetically and sonically, McQuarrie, Hardy, Wenham and composer Lorne Balfe vividly deconstruct what aftermath looks and sounds like. Circles are a prevalent motif, accentuating Ethan’s ongoing “full circle” experience. It’s peppered in subtly, seen in the roundabout in Paris, the church in London, and more. Alongside the polished, brightly lit sequences, Hardy turns in breathtaking low-light work in “The White Widow” Alana’s (Vanessa Kirby) office and club, and in the London underground cellar. He and McQuarrie occasionally will favor capturing the corollary minutes of “Golden Hour” lighting in the “Blue Hour.” Balfe’s score delights the senses. The heartrending, melancholic notes of the string section during Ethan’s introspection hit like a wallop. Later, its percussive tones set the foundation for the climax, emphasizing the building dramatics. McQuarrie finds plenty of moments to favor the symphonic poetry of Balfe’s work over the rat-a-tat-tat of gunfire, enveloping the audience on another level. Perhaps the greatest magic trick McQuarrie pulls off – with stylish panache and substantial gusto – is the least evident. Each MISSION has an unspoken, yet distinguishable checklist: We know Ethan’s gonna go rogue and that his boss isn’t going to trust him. We know there will be double-crosses along the way. We know the team will be tested. The brilliance is McQuarrie makes sure to dazzle us, cloaking the expected in the unexpected, thus birthing a welcomed evolution. MISSION: IMPOSSIBLE – FALLOUT opens on July 27.